Gluten Free Chocolate Quick Bread will change your mind about gluten free baking! Its deep dark chocolate flavor and super moist texture is a treat any chocoholic will love. Over that past few years I’ve received lots of requests for gluten free recipes. I’ve avoided developing and posting gluten free desserts for a few reasons. Mainly- because it has been unknown territory to me. I finally decided to face my gluten free baking fears and take the plunge. The result? 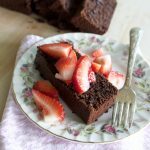 This delicious Gluten Free Chocolate Quick Bread! I’ve eaten some really really awful gluten free desserts in my day. Bakeries that specialize in gluten free baked goods should produce amazing gluten free treats, don’t you think?? Not always the case. I’ve eaten gluten free desserts from bakeries that I’ve spit (politely and discreetly) in to my napkin. Oh my. My gluten free dessert tastings have, for the most part, not been positive to date. Luckily, many improvements have been made over the past few years to gluten free baking! There are so many gluten free flours to choose from now, the options and combinations are endless. Disclaimer- I am by absolutely by no means an expert in the gluten free baking world. I picked up a bag of King Arthur Coconut Flour a few weeks ago, intrigued by the aspect of baking with coconut flour, I set out to find a recipe using this flour. I adapted this recipe from the King Arthur Flour company. My friend Cyd frequently bakes gluten free. She has successfully converted several recipes on ABK to gluten free! Cyd’s baking success has come from experimenting with many different types of gluten free flours, often blending gluten free flours to come up with a perfect baking combination. I’ve sampled some of her treats and they are top notch. It IS possible to make really decadent gluten free treats without compromising on flavor, or dealing with grittiness in baked goods. I decided the best route for me would be to try a single gluten free flour for starters, and since I have had great experiences with King Arthur brand flours, I chose King Arthur Coconut Flour for my first gluten free ABK dessert! Texture and flavor and how to produce tender loaves of bread! I love the texture of this Gluten Free Chocolate Quick Bread. It is similar to a light version of a chocolate pound cake. The sour cream in the batter gives the cake an extra moist texture. I switched out the 6 eggs in the original King Arthur recipe for 3 eggs and 1/2 cup of full fat sour cream. I try to add either sour cream, butter milk or Greek yogurt to all of my quick bread recipes because I think it prevents the bread from being dry. There’s nothing worse than a loaf of dry sweet bread! All the tips and tricks! The batter needs to sit for 10-15 minutes in the pan before baking. I’ve been told that gluten free flours bake up best when the flour is allowed to soak up the wet ingredients before baking. It is also important to let the bread cool in the pan for at least 20-30 minutes before removing from the pan. When baking with gluten free flours, the baked goods tend to be more delicate than when baking with traditional All Purpose flour. The baked products fall apart more easily, which means letting the finished product sit until completely cool will yield the best results. When slicing the bread, make sure the loaf is completely cooled for clean slices! This bread is perfect served with fresh sliced berries for a quick and easy dessert. Start to finish, you should plan on about 1 1/2 hours. This is my first dessert that has been a success using gluten free flour and I’m convinced it won’t be my last! If you’re looking for a treat to make for someone who can’t eat gluten, this is the perfect recipe for you! 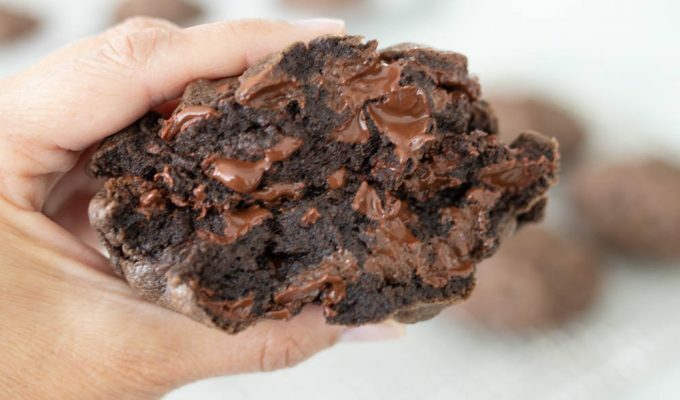 I’m willing to bet if you don’t tell anyone it is gluten free, they won’t know, so Gluten Free Chocolate Quick Bread is the perfect dessert for any crowd! I would love to know what are your favorite GF desserts? Happy (gluten free) baking! Melt butter in a large microwave safe bowl. Whisk the cocoa powder into the butter until smooth. Add 3 eggs and mix until smooth, about 1 minute. Add 3/4 cup granulated sugar and mix for another minute. Add 1/2 cup sour cream and vanilla. Blend until smooth again. Place Coconut flour, baking powder and salt in the bowl and fold into batter until flour disappears. Scrape batter into a lined and greased loaf pan or 8x8 pan and let sit for 10-15 minutes before baking. While batter is sitting in pan, preheat oven to 350 degrees and set rack in center of oven. Place pan in oven and bake for 40-45 minutes for loaf pan (approx 8 1/2 x 4 1/2) or 30 minutes for 8x8 square pan. Cook just until cake is set and toothpick inserted in middle comes out with a few moist crumbs are attached. Remove from oven and let sit for at least 20-30 minutes before removing from pan. Loosen sides of cake by running a butter knife around the edges. Carefully turn over onto a wire rack and let cool completely. When ready to serve, slice and place on plates, serve with ice cream, fresh fruit or whipped cream or dust with powdered sugar. -The original King Arthur Flour recipe calls for sifting the flour, which will produce a slightly higher rise on the loaf. I chose to omit this step for ease of preparation. -When the bread is done, let cool and then turn onto a wire rack. I don't like imprints on the top of my breads when turned onto a rack, so I carefully flip onto a rack, and then turn the bread over again so it is resting on the bottom of the loaf to cool. -1/2 cup of chocolate chips may be added to the batter before baking. -This cake is also delicious drizzled with melted chocolate. Thank you, thank you for the recipe! I follow your blog and have Celiac, so I usually try to adapt your recipes to make them gluten free, with mixed results. I will be making this bread during the coming week. I’m truly grateful! I’m so excited to try this recipe! I’m newly gluten free and am always on the lookout for a delish GF dessert. I’d LOVE some of your friend Cyd’s adjustments to your recipes to make them gluten free! THANK YOU so much for this WINNING gluten free recipe! I have two daughters who have celiac disease, and as you write, it is very difficult to find baked goods/recipes that don’t taste gluten free. We loved this one so much that I sent a copy of your recipe to my daughter’s doctor at primary children’s so that she can pass it out to others! It’s a home run! We hope you will get a chance to write other g-free recipes. We love BOUNTIFUL KITCHEN! So glad you loved this recipe! I am going to try to post more recipes that are gf in the future. I know there is a great need for a treat that is worth eating for readers who have Celiac disease! Thanks for sharing this recipe and for reading ABK! Hi Si! I am so excited to try this recipe. Where can I buy GF King Arthur flour in Utah? Thank you! Both Harmon’s and Smith’s have GF King Arthur flour. Let me know how you like this recipe!